* The Uganda Museum on Kira road. * Uganda Martyrs Shrine or the Kasubi tombs which is the burial ground for the royals in the Buganda kingdom. * Owino and Nakasero Markets. Alternatively, you go for a 1 day Jinja city Tour. 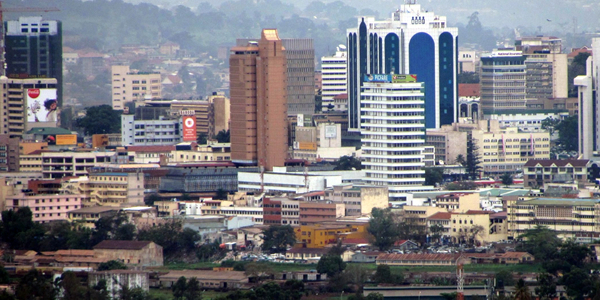 If not a Kampala city tour, then you can go to Jinja which is towards the eastern direction of the country. This was the first capital city of Uganda and still known for having the source of the Nile at the famous Rippon Falls and the Owen Falls dam from where all the electricity that is supplied across the entire country and countries in the neighborhood is generated. You will drive along the Kampala-Jinja road highway and you may stop if you are interested at the sugar cane plantations at Lugazi as well as Kakira, at Mabira Forest which is the biggest natural forest left and you go can go inside for a nature walk and if you do, expect to see monkeys, birds and tree species, there also different accommodation facilities inside there since so many tourists are interested in visiting this forest. You will proceed to Jinja to source of the Nile and the Owen falls dam, you will have you lunch and then go to Bujagali falls to see swimmers dive under those high tides and listen to the rushing sound before you come back to Kampala in the evening. This trip will just like the other cost you US $50 T&C apply. White water rafting is along the source of the river Nile which has to be booked earlier and every body that is above 16 years is free to enjoy. Given the fact that most of the people from different parts of the world have never rafted, you will have a well trained guide to help you navigate which means that all training and equipment is provided on the day. You will only need the costume made life jackets so that you feel safe and comfort. Later on after rafting, you will have a great buffet lunch on a beautiful mid-river island, much beer, soda and water or any thing else that you may want. The exercise for this day also costs $125 per person for a full day. The Nile High Bungee is a remarkable bungee jumps in the World! The thrill seekers prepare to jump 44 meters directly down into the source of the Nile. This Nile High Bungee was set up using world-leading innovation to make the jump a state of the art personal challenge experience. A land or a thousand hills, gorilla trek safaris, primate safari, cultural tourism, visits to genocide memorial e.t.c. Top African safari destination, masai mara wildebeest, African lion safari, Amboseli, Mt Kenya & L. Nakuru. Kenya tours are available at great prices. Combines safari tours in Africa covering the East African destinations. You can visit the Masai Mara beasts in Kenya, Ngorongoro Tanzania , Kilimanjaro Climbing & gorilla apes in Uganda, extensions to S.Africa, Botswana, Zamibia, Egypt and Namibia. 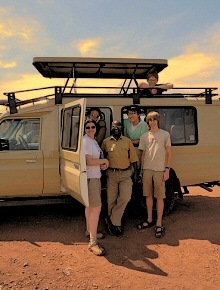 Dear, AA Safaris and Tours, thanks for the wonderful trip. We really enjoyed our gorilla trek with David your guide in this photo..it was a well arranged safari. AA Safaris and Tours Ltd. | Suite F4 Sarah Mall, Old Kampala Road, P.O, Box 28921 Kampala Uganda.